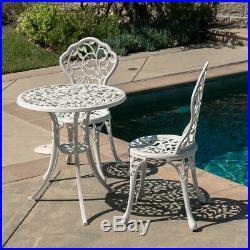 White Iron Cast 3 Piece Bistro Outdoor Patio Set Leaf Design Weather Resistant. Relax outdoors with the 3-Piece Bistro Patio Set. A charming and traditional rose pattern is set into the round table and two chairs to blend with your outdoor ambience. This outdoor bistro patio set is perfect for tea in the garden or patio, or deck. The round table features an aluminum top that add to its elegant design. For added stability and extended durability, the furniture legs are made from cast iron. This outdoor bistro patio set will make a perfect addition for patios that need a traditional setting. Perfect for garden, park, deck, porch, backyard or pools. Stable With Wide Leg Positioning. Constructed of durable, weather proof, cast aluminum. Finished in elegant antique bronze. Neutral colors to match any outdoor decor. Ideal for entertaining guests outdoors. Includes One Table And Two Chairs. Assembly Required And Instruction Included. Materials: Cast iron and Cast aluminum. Table Weight Capacity: 100lbs. Chair Weight Capacity: 300lbs. 24″(W) x 26″(H). 15″(W) x 17″(L) x 33-1/2(H). 1 x Antique Table. 2 x Antique Chair. Ships from our 400,000 sq ft in 2 facility in Los Angeles and Indianapolis. Order before 4am EST Mon-Fri. Item will usually be delivered. Onebigoutlet is one of America top online suppliers of specialized Home Furniture, Home Appliances, Garden products, and High Quality Aftermarket Car Parts. For over 10 years, Onebigoutlet has been providing customers years of insurmountable service. Our highly trained, professional staff provides in-depth knowledge and exceptional personal assistance to customers worldwide. Our number one commitment is to provide unbeatable service at unbeatable prices. Founded in the heart of Los Angeles California, our 400,000 sq/ft warehouse houses thousands of the most comprehensive collection of household tools, home & garden and aftermarket automotive items to fit any of your needs. Onebigoutlet works closely with product manufactures, eliminating middlemen so we can pass the savings onto you. We look forward to building upon our tradition of excellence by continuing to provide exceptional products and services. From California – Los Angeles. From Indiana – Indianapolis. Protective packing materials will be added in your package at no cost if needed. Assures our customers that they will receive all orders promptly and exactly as described. Used items will not be accepted for return. Under no condition will Onebigoutlet be liable for any damages, and in particular will not be liable for special, indirect, consequential, or incidental damages, or damages for lost properties, revenue or use, arising out of or related to the Onebigoutlet account or the information contained within it, whether such damages arose in contract, negligence, tort, under statute, in equity, at law or otherwise. 8:00 P. EST 8:00 A. 5:00 P. We are online only. Who do I contact if I receive a damaged product? If your product is damaged, you may use the contact form provided. We have warehouses in California and Indiana. How long until my order ships? How do I cancel my order? You have 24 hours from the time you place your order to cancel. Do you deliver on weekends? Why isn’t my coupon working? Your coupon may have expired. Only one discount applies per order. Are there promo codes / coupons available for me? As a member of the Belleze community, you may receive special discounts and promotional codes from time to time. You may also see discounts on banners and notifications on our web site. Do you have a showroom? We are only online at this time. Do you offer wholesale prices? We do not offer wholesale pricing. Do you offer any installation services? We do not offer installation services. I received an incomplete order missing parts, manual, etc. , what do I do? Why was my order cancelled? This listing is currently undergoing maintenance, we apologise for any inconvenience caused. The item “White Iron Cast 3 Piece Bistro Outdoor Patio Set Leaf Design Weather Resistant” is in sale since Friday, April 6, 2018. This item is in the category “Home & Garden\Yard, Garden & Outdoor Living\Patio & Garden Furniture\Patio & Garden Furniture Sets”. The seller is “onebigoutlet” and is located in Rowland Heights, California. This item can be shipped to United States. 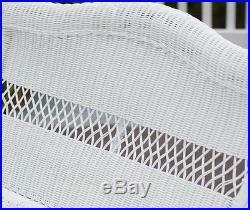 White Resin Wicker Hanging Swing Outdoor Patio Deck Porch Backyard 2 Person NEW. Are you looking to make a relaxing space on your porch or patio, or do you perhaps want to swing under your favorite tree? 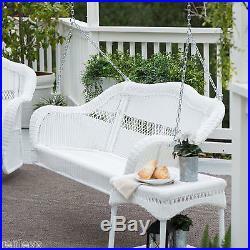 If so, then this White Resin Wicker Hanging Swing is perfect for you. 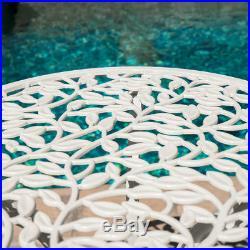 White Resin Wicker Hanging. Designed to be durable and long-lasting. The traditional style and high back make it comfortable. This is a great way to get lost in your favorite book or enjoy the company of friends and family. 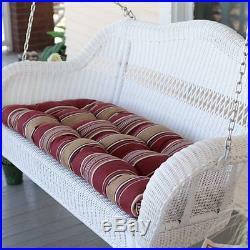 With a maximum weight capacity of 400 pounds, several people can enjoy this porch swing at once. Dimensions 55L x 30W x 24H in. Seat Dimensions 43L x 19W in. Weight Capacity 400 lbs. Cushions are not included. All-weather resin wicker stands up to the elements. Powder-coated steel frame construction. We are sure that you will cover your needs and will enjoy this beautiful. White Resin Wicker Hanging Swing! Our digital images are as accurate as possible. However, different monitors may cause colors to vary slightly. In some cases and on specific items, it might be possible to provide you with more than one tracking IDs. This is necessary in order to secure good transportation from our warehouse to your door. Item must be brand new still sealed not opened. IMPORTANT INFO PLEASE READ CAREFULLY. We thank you in advance for choosing us for your shopping! Positive feedbacks are necessary in order to be able to continue our business with more competitive prices and even more products. Once more thank you for choosing us and we hope to see you again soon. 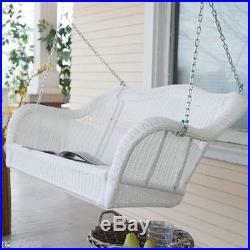 The item “White Resin Wicker Hanging Swing Outdoor Patio Deck Porch Backyard 2 Person NEW” is in sale since Wednesday, May 25, 2016. 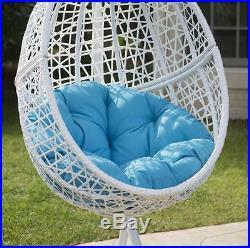 This item is in the category “Home & Garden\Yard, Garden & Outdoor Living\Patio & Garden Furniture\Swings”. The seller is “specialdeals4u” and is located in Multiple Locations, TAX FREE. This item can be shipped to United States. Casco Bay Resin Wicker Porch Swing. Crafted of durable, all-weather resin wicker, this porch swing is virtually indestructible, but it’s styled with classic Southern charm. Resin wicker can stay out all year round and will never fade, crack, splinter, or warp. 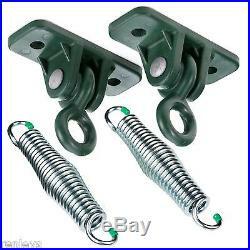 You can choose from several colors for the one that best complements your porch or patio, and you can also choose to add the optional Comfort Springs & Hanging Hooks. Beneath the wicker weave is a powder-coated steel frame. A hanging chain is included so you’ll be ready to start swinging. Additional limited-time savings reflected in current price. Dimensions: 55L x 30W x 24H inches. All-weather resin wicker stands up to the elements. Powder-coated steel frame construction. Seat measures 43L x 19W inches. Hanging chain is included. Optional seat cushion available in colorful patterns. Optional hardware includes comfort springs and hanging hooks. Weight capacity is 400 lbs. Several wicker color options to complement your space. We are an independently owned and operated small business based in Northern California. We also work nation wide to provide you with the best service available. We strive to bring you excellent customer service and the lowest prices possible. We are here 24 hours a day to serve you! Please make sure your mailing address is correct before you pay. We will typically respond to all emails within 24 hours. Q: I entered the wrong address at checkout, what should I do? The item “White Resin Wicker Hanging Outdoor Swing Patio Deck Porch Backyard 2 Person NEW” is in sale since Tuesday, September 06, 2016. 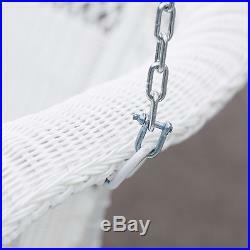 This item is in the category “Home & Garden\Yard, Garden & Outdoor Living\Patio & Garden Furniture\Swings”. The seller is “renleys” and is located in United States. This item can be shipped to United States. For porch, covered patio or yard, this easy care resin wicker swing means. You’ll love its clean lines, timeless style and inviting. But the best part is that it’s beautifully handwoven in all-weather resin. On a sturdy powder-coated steel frame for long life and low maintenance. Store in the off-season to extend its longevity. All-weather easy care wicker swing. Beautiful wicker swing has timeless style. 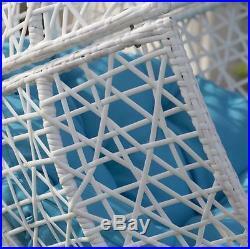 Durable, hand-woven resin wicker swing on a power-coated steel frame. 54″W x 26½”D x 21¾”H; seat 42½”W x 17½D. Seat to armrest 13″; armrest to bottom 14″H; seat to top of back 22H. 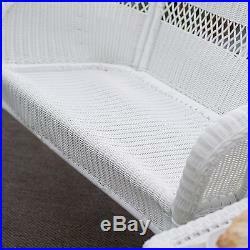 The item “White Resin Wicker Swing Outdoor Hanging Chair Porch Patio Bench” is in sale since Wednesday, May 10, 2017. 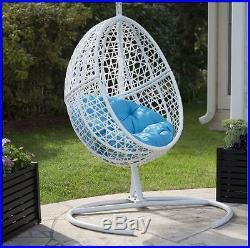 This item is in the category “Home & Garden\Yard, Garden & Outdoor Living\Patio & Garden Furniture\Swings”. The seller is “lets_make_that_deal” and is located in Madison, Virginia. This item can be shipped to United States, Canada. White Resin Wicker Black Cushion Hanging Egg Patio Swing Outdoor Home Furniture. Features White All-Weather Wicker! 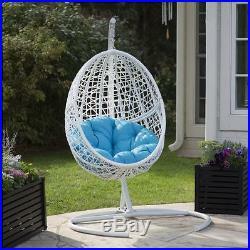 When hanging out tops your to-do list, choose wisely with this hanging egg chair swing with stand. Made to seat just you, this swing chair offers a luxurious space to relax and unwind. The steel frame is wrapped in resin wicker and hangs securely from a durable steel stand. Sturdy yet stylish, this chair holds up to 300 pounds. Offering up serene coastal-inspired appeal, the resin wicker weave in clean white creates a perfect filter for fresh breezes. Walking by without giving this chair a try isn’t an option, as the comfy, tufted cushion, inevitably beckons. Dimensions: 37.5D x 75H in. Designed to comfortably fit one. Steel chair frame wrapped in resin wicker. Includes single, tufted polyester cushion. Strong steel stand included. See pictures for more details! Please no noticeable flaws to packaging. Please contact with 30 days after purchasing item. Thank you very much! Please consider us for any more of your shopping needs! The item “White Resin Wicker Black Cushion Hanging Egg Patio Swing Outdoor Home Furniture” is in sale since Thursday, December 08, 2016. 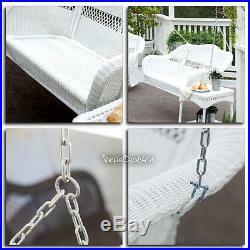 This item is in the category “Home & Garden\Yard, Garden & Outdoor Living\Patio & Garden Furniture\Swings”. The seller is “kountrycomfort” and is located in Milan, Tennessee. This item can be shipped to United States. 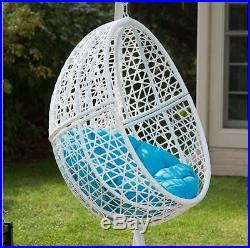 White Resin Wicker Blue Cushion Hanging Egg Patio Swing Outdoor Home Furniture. Features White All-Weather Wicker! When hanging out tops your to-do list, choose wisely with this hanging egg chair swing with stand. Made to seat just you, this swing chair offers a luxurious space to relax and unwind. The steel frame is wrapped in resin wicker and hangs securely from a durable steel stand. Sturdy yet stylish, this chair holds up to 300 pounds. Offering up serene coastal-inspired appeal, the resin wicker weave in clean white creates a perfect filter for fresh breezes. Walking by without giving this chair a try isn’t an option, as the comfy, tufted cushion, inevitably beckons. Dimensions: 37.5D x 75H in. Designed to comfortably fit one. Steel chair frame wrapped in resin wicker. 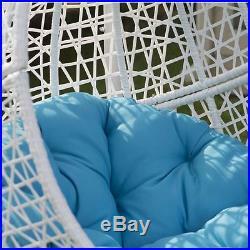 Includes single, tufted polyester cushion. Strong steel stand included. See pictures for more details! Please no noticeable flaws to packaging. Please contact with 30 days after purchasing item. Thank you very much! Please consider us for any more of your shopping needs! The item “White Resin Wicker Blue Cushion Hanging Egg Patio Swing Outdoor Home Furniture” is in sale since Sunday, November 27, 2016. 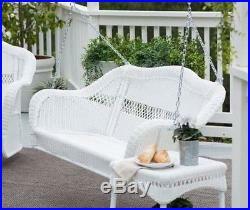 This item is in the category “Home & Garden\Yard, Garden & Outdoor Living\Patio & Garden Furniture\Swings”. The seller is “kountrycomfort” and is located in Martin, Tennessee. This item can be shipped to United States. 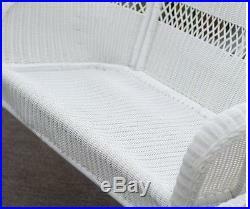 WHITE RESIN WICKER PORCH SWING-2 PERSON SOME ASSEMBLY REQUIRED PLEASE READ POLICY & DIMENSIONS INCLUDED : CHAIN. Are you looking to make a relaxing space on your porch or patio, or do you perhaps want to swing under your favorite tree? If so, then this wicker porch swing is perfect for you. Using resin, Casco Bay designed this wicker swing to be durable and long-lasting. The traditional style and high back make it comfortable. This is a great way to get lost in your favorite book or enjoy the company of friends and family. Dimensions: 55L x 30W x 24H inches. All-weather resin wicker stands up to the elements. Powder-coated steel frame construction. Seat measures 43L x 19W inches. Hanging chain is included. Weight capacity is 400 lbs. Thanks for shopping here! As with online retail stores. Please read dimensions before purchasing any furniture. Please follow the return instructions. Happy customers is my goal. So if you feel for any reason you have not received excellent 100% service– please contact me before leaving feedback. The item “White Resin Wicker Hanging Outdoor Swing Home Patio Deck Furniture Yard Porch” is in sale since Tuesday, November 22, 2016. 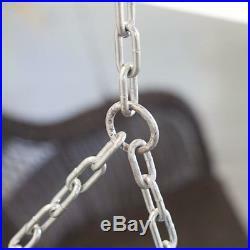 This item is in the category “Home & Garden\Yard, Garden & Outdoor Living\Patio & Garden Furniture\Swings”. The seller is “car4713″ and is located in Fernandina Beach, Florida. This item can be shipped to United States. 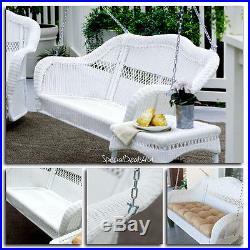 WHITE RESIN WICKER PORCH SWING-2 PERSON SOME ASSEMBLY REQUIRED PLEASE READ POLICY & DIMENSIONS INCLUDED : CHAIN. Are you looking to make a relaxing space on your porch or patio, or do you perhaps want to swing under your favorite tree? 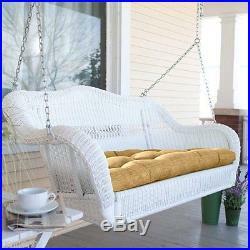 If so, then this wicker porch swing is perfect for you. Using resin, Casco Bay designed this wicker swing to be durable and long-lasting. The traditional style and high back make it comfortable. This is a great way to get lost in your favorite book or enjoy the company of friends and family. Dimensions: 55L x 30W x 24H inches. All-weather resin wicker stands up to the elements. Powder-coated steel frame construction. Seat measures 43L x 19W inches. Hanging chain is included. Weight capacity is 400 lbs. Thanks for shopping here! As with online retail stores. Please read dimensions before purchasing any furniture. Please follow the return instructions. Happy customers is my goal. So if you feel for any reason you have not received excellent 100% service– please contact me before leaving feedback. The item “White Resin Wicker Hanging Outdoor Swing Home Patio Deck Furniture Yard Porch” is in sale since Sunday, September 25, 2016. 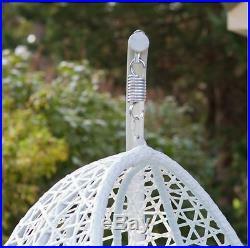 This item is in the category “Home & Garden\Yard, Garden & Outdoor Living\Patio & Garden Furniture\Swings”. The seller is “car4713″ and is located in Fernandina Beach, Florida. This item can be shipped to United States. 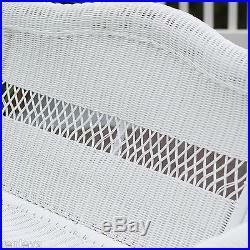 White Resin Wicker Hanging Outdoor Swing Home Patio Deck Furniture Yard Porch. 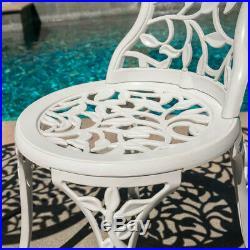 Features Weather Resistant Resin Wicker! 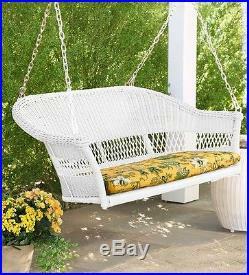 Description: Swing in comfort and style, even putting your feet up with a good book, on this hanging wicker loveseat swing. This durable wicker is made from resin and has been hand woven over a steel frame. It is weather resistant, and will hold up to 400 pounds. Dimensions: 25 inches high x 53 inches wide x 27 inches deep. See picture for more details! Please no noticeable flaws to packaging. Please contact with 30 days after purchasing item. Thank you very much! Please consider us for any more of your shopping needs! The item “White Resin Wicker Hanging Outdoor Swing Home Patio Deck Furniture Yard Porch” is in sale since Saturday, July 02, 2016. 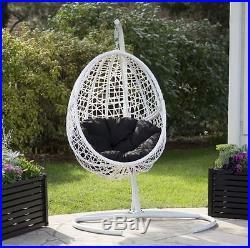 This item is in the category “Home & Garden\Yard, Garden & Outdoor Living\Patio & Garden Furniture\Swings”. The seller is “coolcool_bb” and is located in Bloomfield, New Jersey. This item can be shipped to United States. Dimensions: 55L x 30W x 24H in. Seat Dimensions: 43L x 19W in. White Resin Wicker Hanging Outdoor Swing Home Patio Deck Furniture Yard Porch. Features Weather Resistant Resin Wicker! Description: Swing in comfort and style, even putting your feet up with a good book, on this hanging wicker loveseat swing. This durable wicker is made from resin and has been hand woven over a steel frame. It is weather resistant, and will hold up to 400 pounds. Dimensions: 25 inches high x 53 inches wide x 27 inches deep. See picture for more details! Please no noticeable flaws to packaging. Please contact with 30 days after purchasing item. Thank you very much! Please consider us for any more of your shopping needs! The item “White Resin Wicker Hanging Outdoor Swing Home Patio Deck Furniture Yard Porch” is in sale since Saturday, June 25, 2016. This item is in the category “Home & Garden\Yard, Garden & Outdoor Living\Patio & Garden Furniture\Swings”. The seller is “coolcool_bb” and is located in Bloomfield, New Jersey. This item can be shipped to United States.